Photo: Dennis Schroeder. United States government work (cropped). Massive solar power stations are being built in the world’s “sun belts” — with the US and India competing to have the largest in the world. The US Navy is investing in what will be the largest solar farm in the world in order to provide power for 14 of its bases. The climate of Arizona, where the two earlier phases of the Mesquite solar farm are already up and running, provides 300 days of sunshine a year. And the Navy’s deal to extend the farm is the largest purchase of renewable energy ever made by a US federal government agency. The solar farm project is one of a growing number being installed across what is known as the American Sun Belt — the southern states of America, which have expanding populations, plenty of sunshine, but also large areas of arid and unproductive land. This new type of huge solar farm produces as much power as a large coal-fired plant. The price of solar panels has now fallen so far worldwide that, in sunny climes, they can compete on cost with any other form of energy generation. This new type of huge solar farm produces as much power as a large coal-fired plant. China and India are also building similarly massive installations, taking advantage of their own sun belts and desert regions. It is doubtful that Mesquite 3, huge as it is, will manage to remain the world’s largest for long. In the same week that the US Navy disclosed its plans, the central Indian state of Madya Pradesh announced it was to construct a 750 MW plant (one megawatt is roughly enough to supply 1,000 typical British homes) on barren, government-owned land in the country’s Rewa district. It is claimed that it would be the world’s largest solar plant, and the state’s energy minister, Rajendra Shukla, says the plan is to have the plant up and running by March 2017. A number of other giant projects are also in the pipeline in India, as part of government plans for a dramatic expansion of the industry, although they have yet to be constructed. Mesquite 3, which will be sited 60 miles west of Phoenix, Arizona, will provide the Navy with 210 MW of direct power. This means the installation of more than 650,000 extra solar panels, which will move to track the sun as it crosses the sky, to get the maximum value from the intense desert sunshine. The Navy says it will save $90 million in power costs over the 25-year lifetime of the contract. 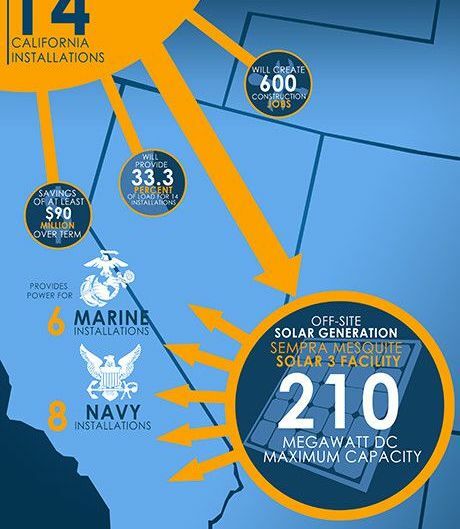 Illustration of how the Sempra Mesquite Solar 3 photovoltaic facility will provide maximum capacity of 210 megawatts of direct current for 25-year term, meeting a third of the energy needs of 14 Department of the Navy instillations. Illustration: US Navy/Austin Rooney. Public domain. Some solar power plants in India have caused controversy because they need teams of people to wash off the layer of dust and particles from air pollution to keep the panels efficient. This uses a lot of scarce water. However, in the cleaner desert air of Arizona, this is not a problem. The Navy boasts that Mesquite 3 will require no water, so saving “this precious resource for other needs”. The building of the plant will require 300 construction workers, but it will create only 12 long-term jobs. The plant also avoids controversy because it is sited on “previously disturbed land”, and so is not damaging a pristine environment. It is also near existing power plants and transmission lines, so will not need additional infrastructure. The Navy estimates that the station will reduce greenhouse gas emissions by 190,000 tonnes annually — the equivalent of taking 33,000 cars off the road. Ray Mabus, the Secretary of State for the Navy, who opened the project, has been pushing hard for renewables to be used for military power generation. In 2009, the US Department of Defense was instructed by Congress to get 25% of its energy from renewable resources by 2025, but Mabus accelerated that goal and directed that one gigawatt (1,000 MW) should be procured by the end of 2015. Mesquite Solar 3 station will reduce greenhouse gas emissions by 190,000 tonnes annually — the equivalent of taking 33,000 cars off the road. The new contract adds to a 17 MW installation at Camp Lejeune, North Carolina, and another of 42 MW at Kings Bay, Georgia. The Navy says that, in total, its renewable energy procurement will be 1.2 GW by the end of 2015, which is well ahead of target. It will use the power for Navy and Marine Corps shore installations in California and surrounding states. Opening the project at one of the installations, the Naval Air Station North Island, in California, Mabus said the project was “a triumph of problem solving” and would help increase the Department of the Navy’s energy security by diversifying the supply. 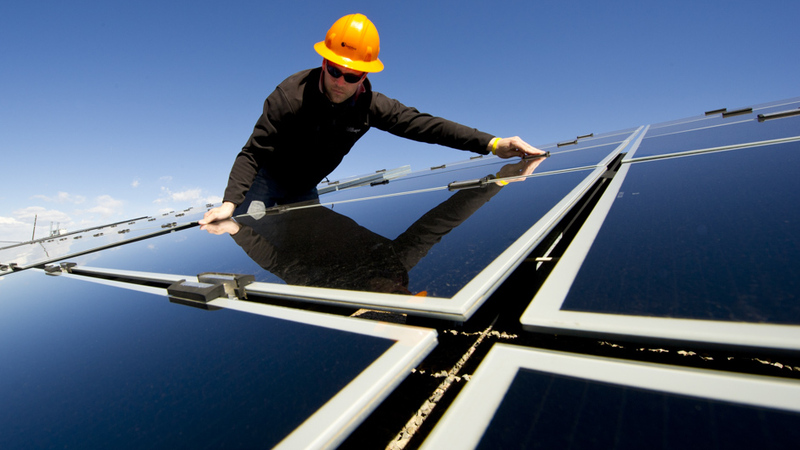 US Navy, India, China Building Big Solar Plants as Prices Fall by Paul Brown/Climate News Network is licensed under a Creative Commons Attribution 4.0 International License. This version includes a title change by Our World editors. Paul Brown is joint editor at the Climate News Network. He has worked as a newspaper reporter and news editor on a number of British regional and national newspapers for 40 years, leaving the Guardian staff in August 2005 after 24 years with the paper. For the last 16 years at the Guardian he was the paper’s environment correspondent, covering a wide range of issues, the most important being climate change. He has written eight books on environmental issues and currently writes a weekly column for The Guardian as well as other freelance assignments. He has written scripts for television documentaries and made numerous appearances on the radio. He is a Fellow of Wolfson College, Cambridge University in England and teaches journalism in Eastern Europe and Asia for the Guardian Foundation.